“Since we were restored to friendship with God by the death of his Son while we were still his enemies, we will certainly be delivered from eternal punishment by his life”(Romans 5:10 NLT). Do you want to experience a real transformation from the inside out? Then you have to spend time listening to God’s word. That’s why we compiled the Transformed Complete Audio collection. These eight messages from Pastor Rick Warren are sure to help you draw closer to God so you can experience the abundant life he designed you to live. You’ll hear messages including . . . 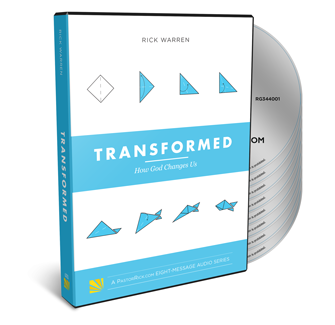 The complete Transformed audio series is our gift to thank you for your financial support of Daily Hope, so please request it when you give below. This collection is perfect for your audio library or to share with a friend or family member. Thank you for your generosity to help more people learn, love, and live God’s Word!